Which project to start next??? Thread: Which project to start next??? I have so many projects I want to do and not sure which one to start on next now that my current project is almost finished. Up to now, they've kinda just presented themselves based on a specific timeframe. Now I have some time to think about it, I don't know what to do next. How do you decide which project is next when you have time to think about it? Last edited by Stitch124; 07-15-2013 at 05:32 PM. When ever I can't make up my mind on a big project .. I do small ones , table runners , potholders and by the time I am finished with one or two .. something kicks in and the next big one becomes clear. whenever I can't make up my mind, I play with scraps. maybe try a new block or technique. Make grocery bags and potholders for gifts. just putter. I do a small project to get myself going! I have a box with scraps pieces of paper with name of a pattern plus where to find it. Close eyes hand in and pick one must admit I do sometimes put it back and try again. It rarely happens, I usually have 3/4 projects on the go all at different stages and I machine and hand work. Do you have a bucket list of projects you want to do? Also a walk over fabric in a shop or on line a piece may inspire. Or have a look at free patterns. I have more quilt I have on my lists than time to do. Lately I've been trying to make personal sized quilts for ailing members of our parish. Our prayer chain more of less dictates who's next on the rag quilt list. I sew strips together for string quilts until I can get a clue as to what I want to do next. Put those blocks in a pile until I have enough to work into a quilt. If I've finished a project whereby I have had to use a little brain power (? ), I usually do an easier pattern to build up my brain cells. Depends on what type of project I just finished. If it was a big one, I do something simple and small. If it was small projects, I'm more likely to start another quilt. But usually it's not an issue--I generally know what I want to work on next. I've been trying to give my shoulders a rest since I finished a huge t-shirt project. 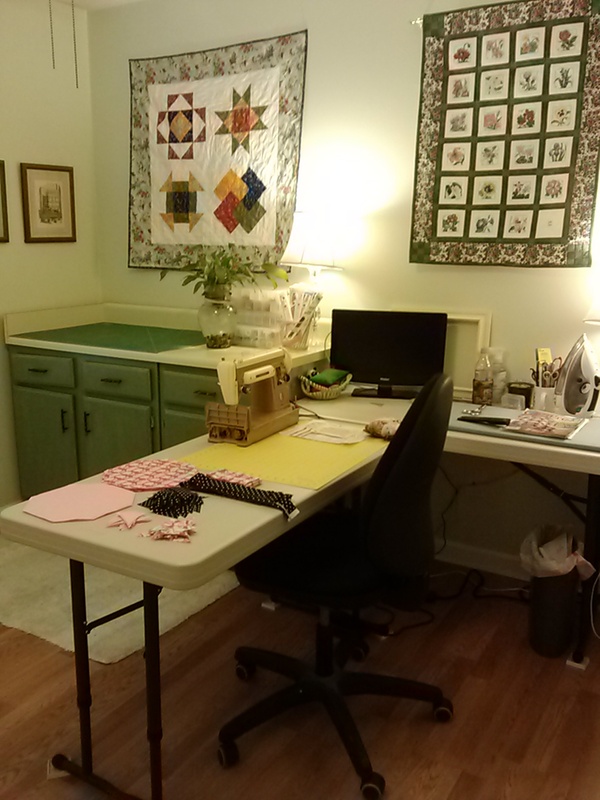 My sewing table isn't set up to the proper height and I had to scrunch up my shoulders to quilt and work on it on the table. Also, the machine isn't flush with the table and my chair isn't the right height to the table so my shoulders really started hurting. I have another quilt ready to quilt. All basted and pinned, but I don't want to stress my shoulders now until I can get my sewing table situation resolved. I plan on getting an IKEA Ingo table and having my DH cut out a space to drop my sewing machine into it to be level with the table. Until then, I'm thinking of just cutting and piecing a small lap quilt for my grandson until I can get my sewing table/machine adjusted correctly. I like to wander the local quilt store and look at samples or just thumb through some quilt magazines. However, I really should dig through the piles of UFOs and choose on of those.